that deletion of the amino group at position 6"' reduces the intrinsic activity to a greater extent than the deamination at the 6'-position . The 5"-hydroxy group of neomycin B was converted to an amino group by treatment of the 5"-tosylated derivative with sodium azide, followed by reduction of the azide to the amino group by triphenylphosphine in the presence of an aqueous solution of sodium hydroxide. The resulting 5"-amino neomycin B was shown to be a better RNA binder, slowing down the ribozyme cleavage more effectively than the parent compound . 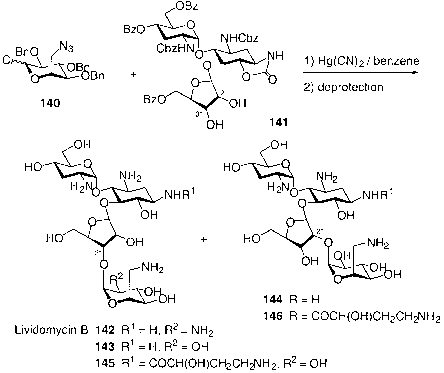 A number of neomycin B derivatives have recently been synthesized to probe the role of ring IV (2,6-dideoxy-2,6-diamino-^-l-idopyranose) of neomycin B in the binding ability of the antibiotic to the ribosomal RNA. To address this role, analogs were synthesized in which the idose ring was replaced with a flexible mono- or diamino tail (123 and 124), or idose derivatives with no amino groups (125) or one amino group (126) were synthesized. The RNA binding data profile of these compounds showed that the idose ring by itself (without amino groups) does not contribute to the affinity or specificity of binding, indicating that the positively charged amino groups presented on the idose ring are necessary for specific binding. 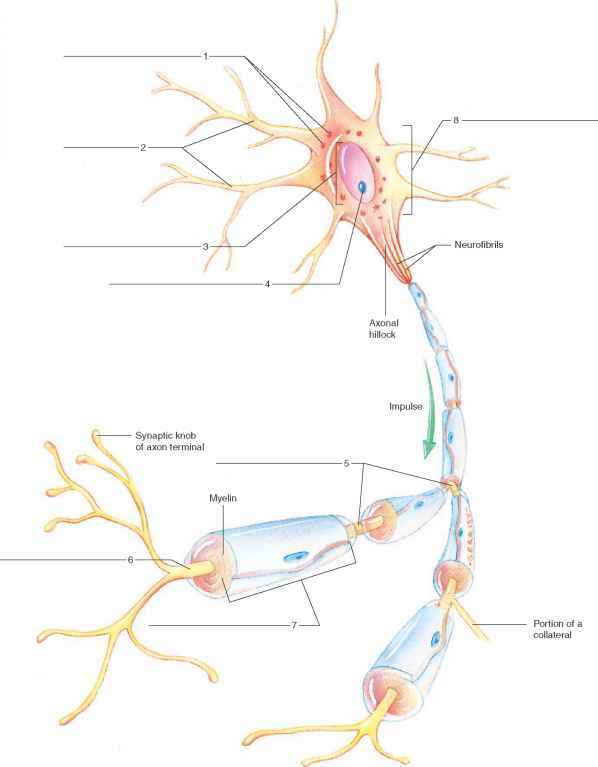 Likewise, these amino groups cannot be replaced by those that have flexible linkers . To synthesize 123 and 124, reductive amination of the neamine-derived aldehyde 127 with the corresponding linear amines was employed, and the glycosylation method was used to prepare analogs 125 and 126 from coupling of the glycosyl acceptor 128 with corresponding idose derivative as glycosyl donors (compounds 123-128). made to examine their antibiotic activities against several sensitive and resistant strains. These include the 4'-deoxy-4'-epichloro 129, 4'-deoxy 130, 4',4"-dideoxy 131, 5"-amino-4',5"-dideoxy-4'-epichloro 132, and 5"-amino-4',5"-dideoxyparomo-mycin 133, some of which showed good antibacterial activity against Staphylococ-cMs-resistant strains (compounds 129-133 ). Among these semisynthetic paromomycins, compounds 131 and 132 showed activity comparable to the parent antibiotic, but together with analog 129 they were more active against 4'-adenyltransferase-producing organisms. Replacement of the 5"-hydroxyl with an amino group, to generate the derivatives 132 and 133, resulted in loss of activity. In another communication the same group described the preparation of a series of paromomycin analogs modified at the 3'-, 4'-, 1-, 6-, and 5"-positions. All the new antibiotics (3',4'-deoxy 134, 5"-amino-3',4',5'-trideoxy 135, 3'-deoxy-4'-epi 136, 5"-amino-3',5"-dideoxy-4'-epi 137, 1-deamino-6,3',4'-trideoxy,-1,6-0-epi 138, and 4'-amino-4'-deoxyparomomycin 139) (compounds 134-139 ) showed more potency than paromomycin against organisms that produced 3'-phosphotransferase and 4'-adenyltransferase, and they were more effective than the parent compound in inhibition of the protein synthesis . compared to 143, whereas the acylamido derivative of the 2"-regioisomer (146) showed marked diminution in activity  (compounds 140-146 ). The same group also synthesized 5"-deoxy-5"-fluorolividomycin B, using di-ethylaminosulfur trifluoride (DAST) as the fluorinating agent. The antibacterial activity of this fluorinated compound was reported to be less than that of the parent antibiotic . The 2',3'-epimino derivative of ribostamycin (149) was prepared from the corresponding 3'-tosyl derivative 148, using sodium hydride for the cyclization step. However, no intrinsic antimicrobial activity was observed for this epimino analog  (compounds 147-149). 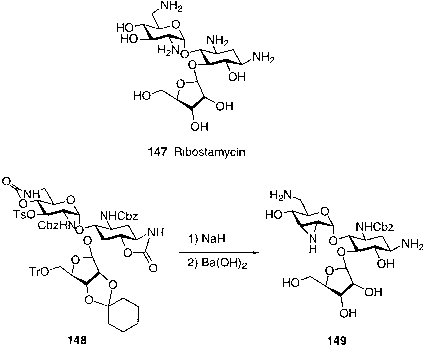 A glycosylation approach was used to prepare ribostamycin 147 and its 4"-thio analog from neamine and appropriately protected glycosyl donors ribofuranosyl or 4-thioribofuranosyl derivatives . 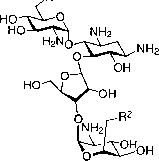 In another synthesis, d-glucosamine and ribose were used to prepare ribostamycin via an aminotrisaccharide intermediate . 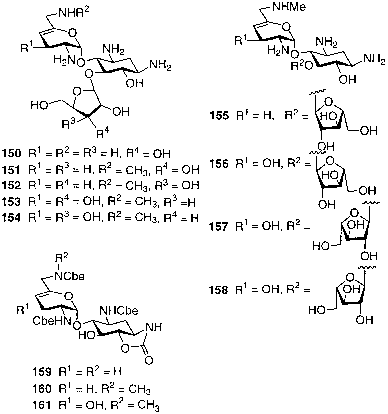 A number of ribostamycin analogs (150-158 ) have been synthesized by glycosylation of various ribofuranosyl derivatives with the three protected sisamine analogs 159, 160, and 161 (compounds 150-161). 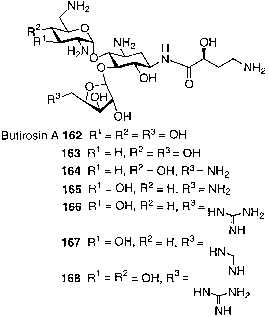 These ribostamycin analogs showed only modest antibacterial activity, compared to ribostamycin . catalytic hydrogenation. These deoxy analogs showed improved activities over bu-tirosin and gentamicin against certain phosphotransferase-producing organisms, particularly Pseudomonas aeruginosa and Staphylococcus aureus. A number of 5"-amidino and 5"-guanidino analogs of butirosin A and its 4'-deoxy derivative (compounds 165-168) were also prepared by another research group. Among these analogs, 166 showed the best activity against most strains tested, but it was similarly more toxic than the 5"-hydroxyl derivatives (e.g., butirosin A, 162 and 163)  (compounds 162-168 ). and sodium azide to prepare compounds 172, 173, and 174, respectively. Treatments of 172 with NaOMe in MeOH and then Raney nickel, 173 with NaOMe in MeOH, and 174 with NaOMe in MeOH, then Pd-C and hydrogen, afforded the kanamycin analogs 175, 176, and 177, respectively, which were subjected to Ba(OH)2 to furnish the title compounds 178-180 (compounds 169-180 ). 3'-Deoxykanamycin A, an antibiotic resistant to 3'-phosphotransferase-modi-fying enzymes [(APH)3'-Ia's], has been prepared via two different routes. One route used Barton's deoxygenation protocol , and in another a mixture of 2',3'- and 3',4'-epoxy intermediates of kanamycin A derivatives resulted in the formation of a single product (3' -deoxy derivative) upon reduction with Raney nickel or sodium borohydride . In another synthesis, Iwasawa and colleagues  used 3'-deoxyamikacin (181), which has shown better antibiotic activity than amikacin (2), to prepare a number of amikacin analogs including 5,3'-dideoxy- (182), 5,3',6"-trideoxy- (183), and 3',6"-dideoxyamikacin (184). The 5-deoxyamikacin 185 was also synthesized from amikacin (2). Among these analogs, 3',6"-dideoxyamikacin (184) showed the strongest antibacterial activity compared to amikacin and the other deoxy derivatives (compounds 181-185 ). of the vicinal hydroxyl groups at the 2'- and 3'-positions, followed by treatment of the product with sodium iodide in DMF in the absence of zinc dust. In the other method, a 2',3'-epoxy derivative was employed and converted to a 2',3'-iodohydrin derivative via hydrogen iodide assisted ring opening of the epoxide, which then was mesylated at the 2'-position to furnish the 2',3'-unsaturated intermediate. The 2',3'-deoxyamikacin showed slightly enhanced antibacterial activity compared to amikacin. A number of kanamycin analogs, including 3'-deoxy-2'-epi-kanamycin A , 5-deoxy-, 5,4'-dideoxy-, 5-deoxy-5-epi-chloro-, and 5,4'-dideoxy-5,4'-di-epi-chlo-rokanamycin A , as well as 3'-deoxykanamycin B (tobramycin) , were prepared and tested against several sensitive and resistant organisms. Antibacterial activity data profile revealed that deoxygenation of kanamycin at the 5-position results in the loss of activity and that the 4' -epichlorination of kanamycin A results in lack of activity.